Walker signed with Indianapolis' practice squad Friday. Analysis: Walker now begins his fifth stint with the Colts' practice squad. The 23-year-old quarterback will serve as an emergency option behind starter Andrew Luck and backup Jacoby Brissett. Walker was released from the Colts' practice squad Wednesday. Analysis: This marks the end of Walker's fourth stint with the Colts' practice squad. With Andrew Luck enjoying solid health this season and Jacoby Brissett locked in as the backup, Walker was primarily thought of as an emergency option. 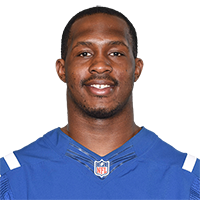 Walker could find his way back to the Colts' practice squad if the team promotes other members to the active roster at a later time. Analysis: Walker was previously released from the Colts' practice squad Oct. 23. The 23-year-old also participated in Indianapolis' offseason program and training camp this summer before being waived prior to final cuts. With Jacoby Brissett is locked in as Andrew Luck's backup, Walker is unlikely to find a role as anything more than an emergency option this season. There are no videos available for Phillip Walker. Click here to view all videos.